Are you wondering how you can create a free professional email address for your business? Then you’re in the right place. A business email address builds trust among your customers as compared to the generic ones. Hence, it’s always recommended to use them for your brand. 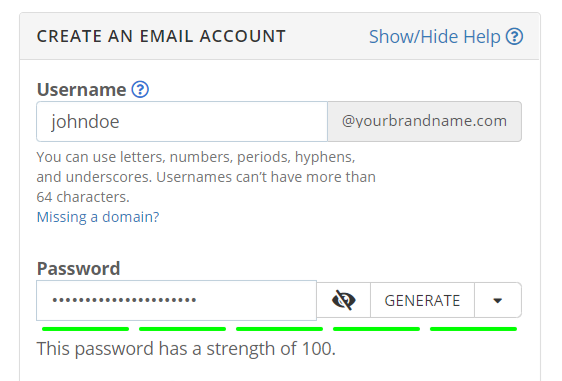 In this article, we’ll show how you can set up a free business email address in 5 minutes. What Is a Business Email Address? A business email address is a professional looking email address that has your business domain name after @ instead of Gmail, Yahoo, or Outlook. Let’s explain it with the help of an example. Say, John Doe wants to create an email address for his business ABC limited. So, the professional email address of John Doe should be johndoe@abclimited.com and not something like johndoe.abclimited@gmail.com. It’s brandable and easy to remember. Customers trust business emails more than the generic ones. Before we get to the “how”, first let’s talk about what we need to get started. The most important thing that you need is a domain name. For those who don’t know, a domain name is the address of your website. For example, when you type google.com in the address bar of your web browser, you’re directed to the homepage of Google. So google.com is a domain name. Apart from a domain name, you may also have a live website. But that’s not a requirement for creating your professional email account. Now, if you do a quick search on Google, you’ll find many ways using which you can create a business email. However, you should be careful with this approach as you may end up losing your important data. With reliability and security in mind, we’ll share two methods with you in this article using which you can create your business email address. So without further ado, let’s get started with the first method. Though it’s not a requirement to have a website for your business email, it’s certainly recommended to have one. Why? Because a website is the best way to promote your brand online. To start a website for your business, you need two things: a domain name and a web hosting account. We already explained what a domain name is. But what is a web host? Well, it’s the place where your website files are situated. And the good news is most web hosting companies provide free business email service to their customers. Normally, a domain name will cost you $14.99 per year, whereas the price of the web hosting service starts from $7.99 per month. We know it can be a lot for a startup or a single business owner. That’s why we recommend Bluehost for starting a website. 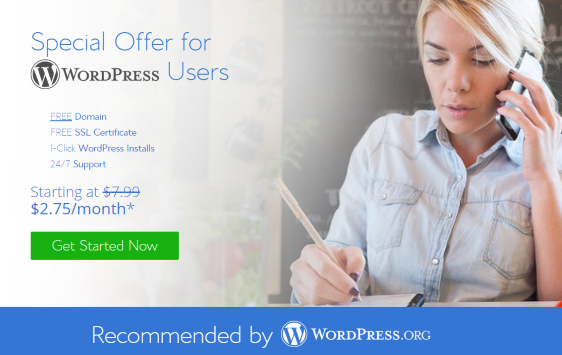 Bluehost is one of the oldest web hosting companies and it’s also recommended by WordPress.org. You can purchase their service starting at $2.75 per month and also get a free domain. Not only that, but they’ll also provide free professional email service with all their plans. Isn’t that great? So let’s start the step by step process. First of all, go to the Bluehost website to get things started. We’ll sign up for their hosting service and also register a domain name for our business. 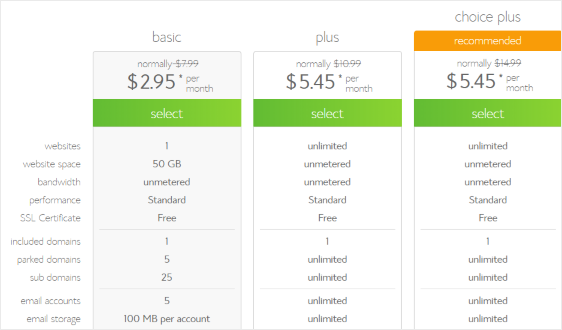 So click on the Get Started Now button to select a hosting plan. Bluehost offers three hosting packages to its customers: Basic, Plus, and Choice Plus. All these plans provide tons of features including free email service and a free domain. In most cases, the Basic and Plus plans are suitable for most bloggers, startups, and small businesses. And you can always upgrade to a higher plan later. So choose a plan as per your needs and then click on Select to proceed to the next step. In the next page, you’ll have the option to register your free domain name. A domain name represents your business, so make sure you use your brand or company name as your domain name. You may read this guide on how to choose a domain name for more information. So enter your preferred name in the text box, select a domain extension, and click Next. 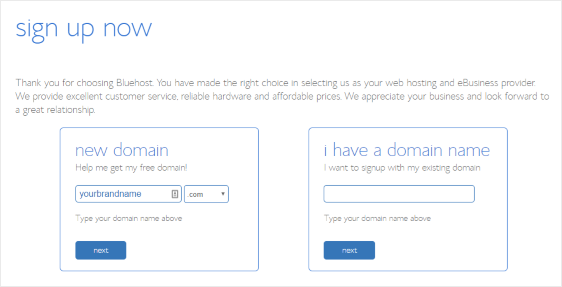 If your preferred domain name is not available or already registered, Bluehost will suggest some alternative names. You can also search for some variations of your business name, but make sure you don’t use hyphens (-) and numbers in your domain name. Once a domain name is available for registration, you’ll be taken to the last step. Here you’ll have to provide various information to Bluehost so that they can create your account. The form on this page is divided into 4 parts: account information, package information, package extras, and payment information. While account information asks for personal details like name, address, phone number, and email address, package information lets you select the account plan. As far as package extras are concerned, we recommend you to uncheck all the options. You can always purchase them later if you need them. Finally, provide your payment information to purchase your Bluehost hosting account. If you want to pay using PayPal, then click on More payment options. Once done, click on the checkbox to accept the terms and conditions, and then click submit. Congratulations! You’ve successfully created your hosting account. You’ll now receive a welcome email from Bluehost with important details including your cPanel login credentials. Note: cPanel is the place where you can manage your domain name, hosting, and email accounts. Now that we’ve registered our domain name, its time to create a professional email address for our business. So head over to your Bluehost account and click on Email & Office, present in the left sidebar. A page will open up showing all the domain names you have in your account. Whether you’ve got a single domain or multiple ones, click Manage once you find your business domain name on this page. Next, click on the Create button, present on the right side of your screen, to open the “Create an Email Account” page. Here, you’ll see a simple form asking for a new username and password. Your username in most cases should be your name, something like johndoe or john. However, you can also create an email address for your staff or department. Whatever the case may be, make sure the username is short and sweet. Also, don’t forget to enter a strong password. You can also use the Generate button to get a randomly generated password. Once done, go to the bottom of the page to click Create. That’s it! You’ve created your first professional email address for your brand. Repeat the same process for creating more accounts. The next important thing is to access our inbox for sending and reading emails. To do that, you’ve to go to your Bluehost dashboard and then click on Email & Office. Next, find your domain name and click Manage. Here you’ll see your newly created email address. Now click on Check Email to access your inbox. This will take you to a new page and will ask you to choose a webmail application. Select any one of them to open the inbox of your email account. You can now compose a mail, read your new emails, or even delete the existing ones. Along with the above method, you can also use an email application like Microsoft Outlook 2010 for Windows to check your emails. Before we start, you should know that this method is not free. However, G Suite offers tons of features and hence, we decided to include it in this article. Most importantly, G Suite is a product of Google and hence, you’ll be able to use Gmail’s interface for managing your business email account. The basic plan of G Suite costs $5 per month for each user. It offers 30 GB of space in Google Drive to every user and allows them to access Gmail, Docs, SpreadSheet, Slides, Calendar, and Video conferencing. Also, it comes with a 14-days free trial option. So, you can easily try their service first and then decide whether to continue or not. Anyways, let’s get started with the process of setting up your business email address using G Suite. It’s time to get our hands dirty, so head over to the G Suite website. Here you’ll find two plans: Basic and Business. For the time being, we recommend you to start with the basic plan. You can always upgrade to the business plan later. So click on Get Started to proceed to the next page and start the setup wizard. First of all, you’ll have to provide some details like your business name, country, and the number of employees you’ve in your company. 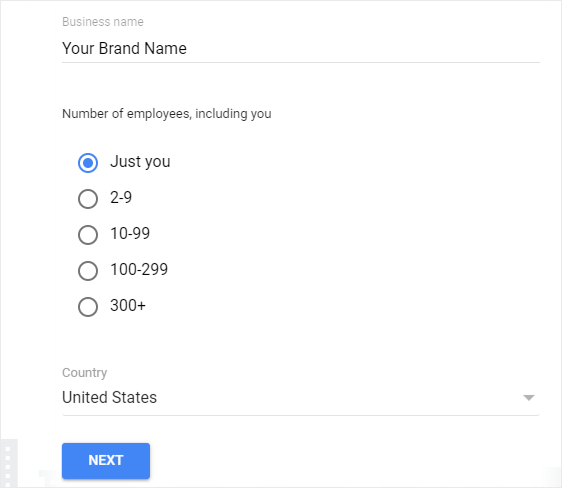 If you’re a single business owner, then you can select Just You. Once done, click on Next. Whether you selected one person or more than that, you need an administrator account to manage everything including users and payments. That’s why you need to provide some personal details like your name and current email address. 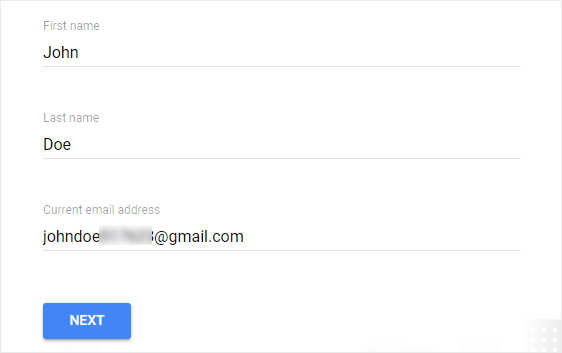 This will create a G Suite admin account. In the next step, the setup wizard will ask whether you already have a registered domain name for your business or not. 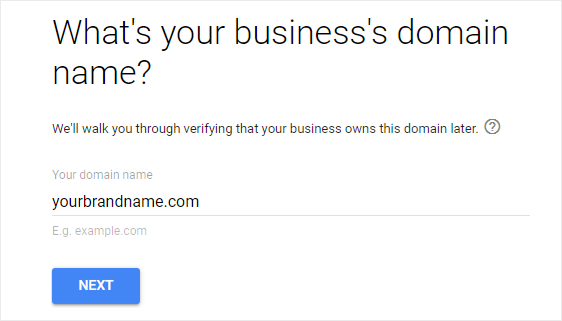 In case you don’t have a domain, you can click on No, I need One to purchase a new domain name from Google. However, you should note that you’ll be charged $14.99 per year. Pro Tip: You can get a free domain name with every Bluehost web hosting plan. Anyways, we’ll assume that you already have a domain name. So, click on Yes, I have One I Can Use and enter your domain name in the next step. G Suite wizard will check whether the domain name is valid or not and then will ask if you want to continue with the same. Next, you’ll be asked to select a username for your business email. You can choose your first name, last name, or a combination of both. Also, select a strong password and prove that you’re not a robot. Once done, click on Agree and Create Account. That’s it! You’ve created your G Suite account. But your job is half done. Click on Go to Setup to proceed to the next step where we’ll show how to create accounts for other users. To add new user accounts other than the admin account, click Start to begin the process. Now add details like first name, last name, and username and click Add to create a new account. Repeat the same process for the rest of your team members. Once you’re done, tick the checkbox that says “I added all user email addresses” and click Next to proceed to the domain verification process. If you need a business email just for your own use, then tick that checkbox and proceed to the next step without creating another account. And don’t worry, you can always create more user accounts later if you want. 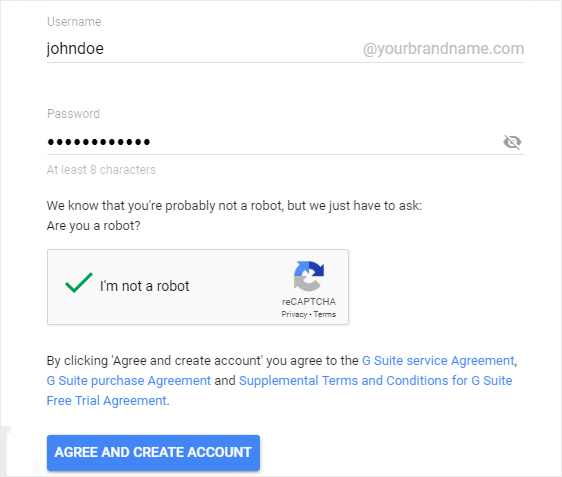 Though you’ve created your professional email address, it won’t work until and unless you connect your G Suite account to your domain name. And to do that, you’ll have to first verify that the domain name belongs to you. G Suite offers different methods using which you can complete this step. However, if you already have a WordPress website, then you can verify your domain by adding a meta tag in the head section of your homepage and that too with the help of a plugin. We’ll use the free Insert Headers and Footers plugin to add the meta tag. Go to Plugins » Add New on your WordPress admin panel and search for Insert Headers and Footers in the search bar. Once you find it, install and active it. Now go to Settings » Insert Headers and Footers and paste the G Suite verification meta tag in the Scripts in Header section. Once done, click on the Save button. Next, head over to your G Suite wizard and check the I added the meta tag to my homepage option to proceed to the final setup process. Now it’s time to add MX records to your domain’s DNS. Wait! What is an MX record? An MX or Mail Exchanger record specifies where the email server is for a particular domain so that all the emails can be sent to that server. 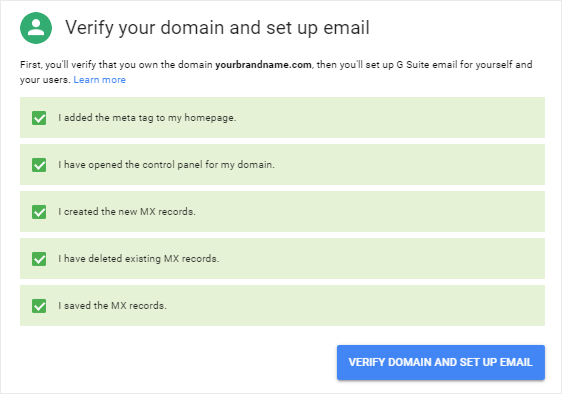 In simple words, you have to make some changes (add MX records) to the settings of your domain so that your emails can be directed to your G Suite account. So first of all, open the control panel of your domain registrar or web host and then, go back to the G Suite setup wizard to click I have opened the control panel for my domain. 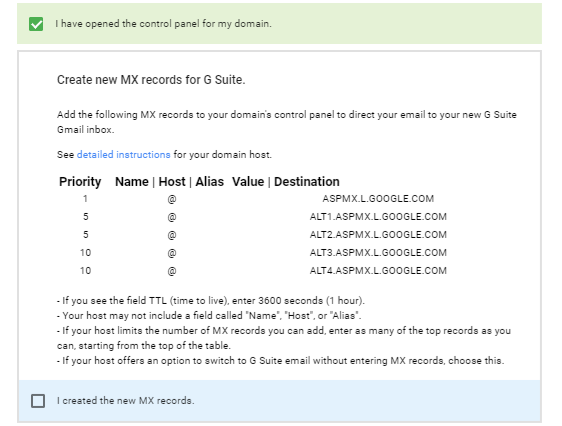 G Suite will now show you some MX records which you need to add to your domain’s DNS. Whatever your case may be, the process of adding MX record is similar for every domain registrar or web host. Let’s show you how to do this on our Bluehost account. Go to your Bluehost dashboard and click on Domain. Here you’ll find all your registered domains. So click the checkbox of the domain name for which you want to add MX records. On the right side of the page, you’ll find the option DNS Zone Editor. Click on Manage to continue. Make sure you do this for each MX record and click Add Record. If successfully added, the new records will be present under the MX (Mail Exchanger) section on the same page (scroll down to check). Once you’ve added all of them, go to the G Suite wizard and click I created the new MX records. Next, you’ll have to delete any existing MX records you had earlier. So go to the DNS zone of your domain and delete all the MX records except the new ones. Click on I have deleted existing MX records and then on I saved the MX records. Finally, click on Verify Domain and Set up Email to complete the verification and setup process. In the last step, we’ve successfully added the MX records and also verified our domain name. So, our business email address is now ready for use. But you might be wondering where the option to make payment is. Well, as stated earlier, G Suite comes with a 14 days free trial and hence, you can start paying after that period. To manage the user accounts, payments, and more, you can visit the G Suite Admin panel and do the needful. How can you access your G Suite email inbox? You can either go to the Gmail website or use the Gmail app on your phone. As simple as that! That’s it! You’ve now created a professional email address for your business. Do you want to know how to brand your emails and make them look more professional? Check out these 6 email branding tips for small businesses. If you liked this article, then please follow us on Twitter and Facebook to get updates from our blog.